With Michael Jordan now part owner and President of Basketball Operations for the Washington Wizards, Wilson Smith rolled out the marching boot-inspired Air Jordan XVI. With Michael Jordan now part owner and President of Basketball Operations for the Washington Wizards, Wilson Smith rolled out the marching boot-inspired Air Jordan XVI, highlighted by its signature off-court magnetic shroud. Subtly, the XVI also paid homage to iconic models of the past. The mid-cut was pulled from the Air Jordan III; mesh inserts were linked to the Air Jordan V; and the Air Jordan XI motivated Wilson to use patent leather on the toebox and tongue. The XVI was also briefly worn by MJ when he once again decided to end his retirement and suit up for the Wizards in 2001-2002. Michael laced up the "Ginger" colorway during the pre-season before moving on to the XVII for the regular season. 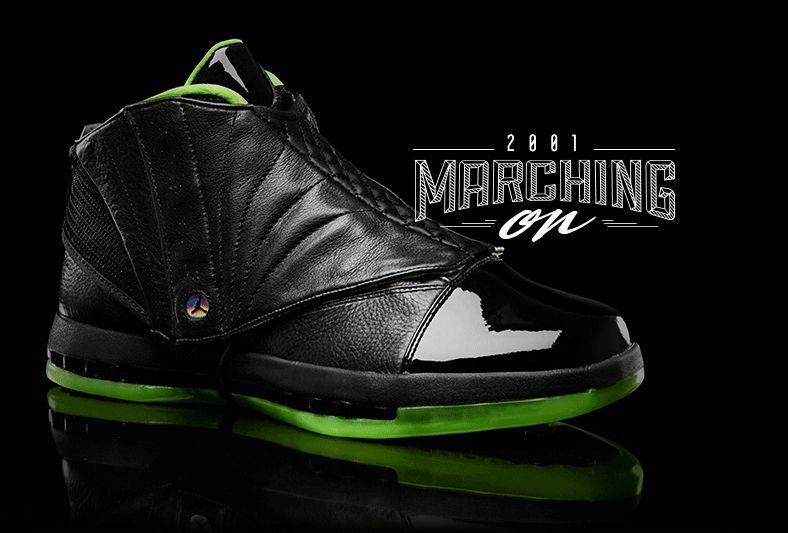 For Day 16 of the XX8 Days of Flight, Jordan Brand shares the XVI in the celebratory black and neon green colorway. Continue to follow the XX8 Days of Flight here at Sole Collector, ajxx8.com and @Jumpman23 on Twitter. Also, don't forget to share your XVI photos on Instagram for a shot at winning the Jordan Brand's XX8 Days of Flight Giveaway.